Sophie grew up in Suffolk and now lives in Surrey with her boyfriend, David and cat Loki. After graduating with a Masters in Psychology at The University of Toulouse, Sophie went on to join the British Army as an Officer in the Royal Artillery. After leaving the Army behind her, Sophie finally had her own kitchen. After volunteering to make a friend’s birthday cake, Sophie discovered she had a natural talent for baking and more recently, a passion for patisserie. When she is not baking, Sophie enjoys track cycling, rowing, teaching Military boot camps and is also training to be a stuntwoman. Bring your biscuit baking to life with a Showstopping game of Sophie’s Snakes & Ladders lemon and chocolate biscuits. 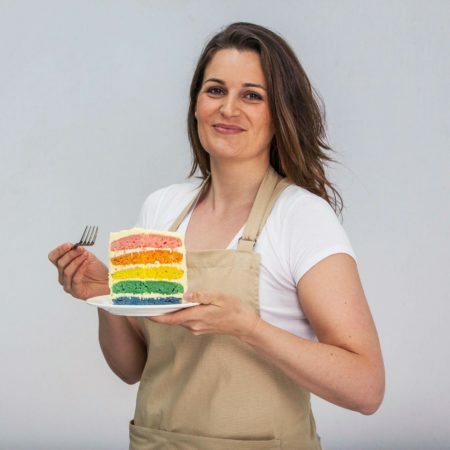 The judges said Sophie’s Trifle Terrine was worthy of a Michelin-starred restaurant, so it’s probably good enough to serve at your next dinner party. A miniature loaf to make Paul Hollywood swoon – Sophie’s flavoured brioches are a weekend wonder.